I am very excited to introduce you to the Rubbermaid Hidden Recycler that gets recyclables off the counter and hidden out of sight. Of course, it all starts at home. No one said recycling would be easy, especially if you’re tight for space. But with a little effort and ingenuity, there’s no reason it needs to be difficult—even if you live in an apartment or have limited storage space for recycling. The key is managing recyclables inside your home prior to transferring them outside—whether it’s to another storage place or to the curb. • Recycling does require a degree of attention to detail on the part of the recycler. And cleanliness does count—rinsing your cans makes them easier to process, which keeps costs down (and also effectively neutralizes the smell factor in your kitchen). • Hardware: Items such as computers, cell phones and even eyewear can be recycled or repurposed. Look online for local organizations that accept them (a host of retail stores across the country, for example, collect cell phones for donation or recycling). Disclosure~ I received for FREE a Rubbermaid Hidden Recycler to review for this post. All opinions are my own. No other compensation was given or received in order to post my review of the product. 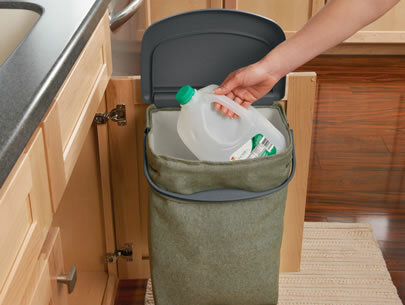 I just luv the Rubbermaid Hidden Recycler! It has many uses not just for collecting recycled materials. My son has since taken the recycler to his room and now uses it to keep his room clean. The handles make it easy to hang from just about anywhere. The beg itself is easy to clean just toss in the washer. It does not loose its shape after being washed and looks brand new after each wash! The bag itself has a leak proof lining for any liquids that are left in the containers. The handle allows you to dump it and not have to touch the items. If you don't want to wash it, you can just wipe it out with a towel or cloth. I like that the bag is made from recycled materials. My family and I give the Rubbermaid hidden Recycler a 5 out of 5 rating. Its easy to assemble and hides out of site. I would use it for cans and plastics. :-) What an awesome product! i think this would benefit me. i would use it for cans. I would recycle cardboard, which is the one thing our trash dump accepts. We recycle everything you can from glass jars and plastic to milk jugs and cardboard. We even recycle our food scraps, egg shells, coffee and tea to our yard waste can. I try to do my part in keeping less trash from our landfill. I'd choose all those cat food cans that clutter up my trash. I would recycle everything. Right now we just have a tote in the laundry room where we throw all of our recyclables. This would make it so much easier to recycle, and have it out of site!